I have never knowingly watched a film based on a Nicholas Sparks book, and this is something I've been quietly very proud of. And it seems I've accidentally proved myself right, because despite seeing the trailer and thinking it looked pants I found myself sat in front of his latest offering today. I'd quite forgotten what the trailer had featured, such was its impact, and I'd either missed or forgotten that Sparks (he of The Notebook, Dear John etc) was ultimately to blame. 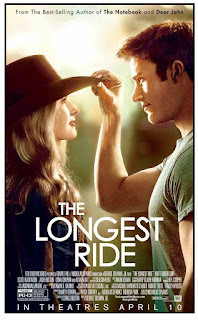 The story, such as it is, follows the path of true love with student and future art-loving intern Sophia (Britt Robertson) and bull-riding bare-buttocked man hunk Luke (Scott Eastwood), who throw themselves together after pulling Ira (Alan Alder) from a burning car. And rescuing his box of letters. These are vital to everything. From here, and having previously agreed that they couldn't be together what with her moving to Manhattan n all, our loving couple set about being a couple while Sophia spends the hours she's not studying or smooching visiting her new hospitalised friend. Contrived would be an understatement. Through these hospital chats, however, Ira (I'm pretty sure Alder only took this part because he wouldn't have to stand or try to actually act) tells the story of how love conquered all for him and his beloved way back in '41. There are subtle parallels being drawn between the two relationships, which could pass you by if you're not paying full attention. By that I mean not fall asleep. Because if there's one thing this film doesn't do, it's subtle. 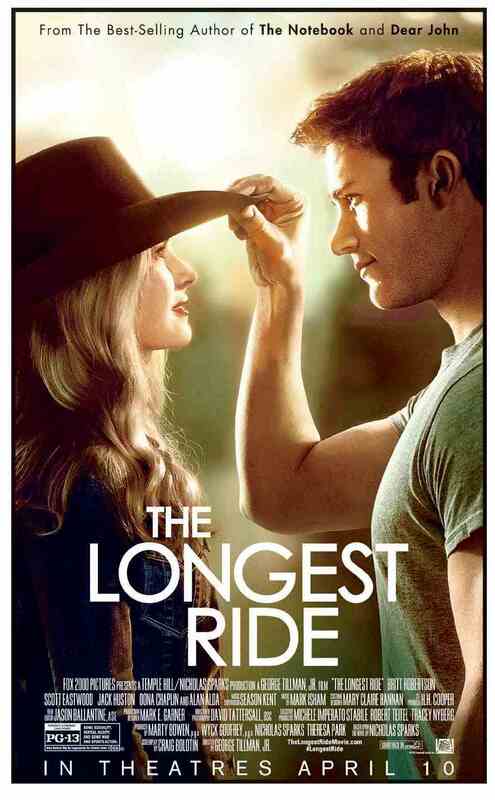 The dialogue is weighty and meaningful to the point of making you laugh out loud, scenes of longing stares and love-filled smiles smack you between the eyes on a regular basis, while the product placement around the bull riding sequences would give the Bond team food for thought. Basically, if this was on the Hallmark channel on a Sunday afternoon you'd think it a bit OTT. It's so sweet and sugary it should come with a health warning for diabetics. And you'd really better love Country. And not just the music. Everything that's Country. You get line dancing, the bull thing, more Nashville ballads than Dolly's managed in her entire career, boots and hats for all, and a massive ranch. In fact, this film is so full of people looking longingly at each other in a Country way that bits of the plot seem to have dropped out. It's the only explanation I can find for the number of times things are mentioned - and accepted as fact - despite never having been mentioned before. It's like whole other conversations have gone on behind closed doors. Or maybe while Ira's banging on about life and love in a bygone age. And the damn thing is so polished you almost need shades to watch it. Even the nostalgia scenes have the same sheen. Even the bit of war action is bloody polished! It's the best looking muddy field you'll ever see. And it's long. So so long. It's actually only two hours, but it feels like twice that. At least. Which is hugely ironic given you only have to hang on to that bull for eight seconds. It takes skill to make eight seconds feel like a lifetime, but somehow director George Tillman Jr has mastered it. His other half must be delighted. All of this pales into insignificance, though, because what has annoyed me most about this film - more than the smouldering looks, the clear use of beefcake to appeal to a certain graphic, the slow-motion horse riding and the appalling dialogue - is that it made me laugh. Just once, right at the end, and with a "twist" so cliched and obvious I'm ashamed by my own reaction, but sadly laugh I did. That doesn't make up for the previous 115 minutes, though, even if it was a good laugh.